The Continental GT3-R is a highly exclusive and unique interpretation of performance-focussed luxury. Bentley engineers have developed a retuned version of Bentley’s race-proven, high performance 4.0-litre twin-turbo V8 for its new two-seater GT. Developing 580 PS (572 bhp / 426 kW) and 700 Nm of torque, together with a 100 kg weight reduction and shorter gearing, the Continental GT3-R is the fastest-accelerating Bentley ever. Capable of reaching 60 mph from a standstill in just 3.6 seconds (0-100 km/h in 3.8 secs), the GT3-R is a Grand Tourer with the performance of a racer. Complementing the revised powertrain is the new all-wheel drive system, which now features torque vectoring for the first time. Together with modified Electronic Stability Control (ESC) and a chassis tune optimised for outright cornering ability, the Continental GT3 R is the most dynamic, responsive and involving Bentley road car ever. For the GT3-R, Bentley’s powertrain division set about developing a special combination of engine, driveline and exhaust to create an evocative, powerful yet efficient system. Bentley’s popular and widely acclaimed 4.0-litre twin turbo V8 engine has been fitted with precision-honed high-boost turbochargers and developed with new engine control software to liberate 580 PS at 6,000 rpm and 700 Nm of torque from 1,700 rpm. To provide a dynamic capability unmatched in the Grand Touring sector, the GT3-R receives a chassis system focussed on performance whilst retaining a cossetting level of refinement for everyday use. Air springs and dampers use a development of the sports-tuned setup from the Continental V8 S, while lightweight forged 21” wheels and high-grip Pirelli tyres deploy the torque-vectored power output of the engine. This combination, together with a sport-focussed Electronic Stability Control programme, offers the Continental with a new level of handling dynamics and turn-in agility, while both the chassis and powertrain respond immediately to throttle inputs. All Bentleys are a combination of luxury and performance, and the Continental GT3-R is no exception. It features a unique two-seat cabin handcrafted from carbon fibre, Alcantara® and the finest leather. Carbon fibre is also used to create beautifully sculpted door casings that also include diamond-quilted Alcantara® inner panels. 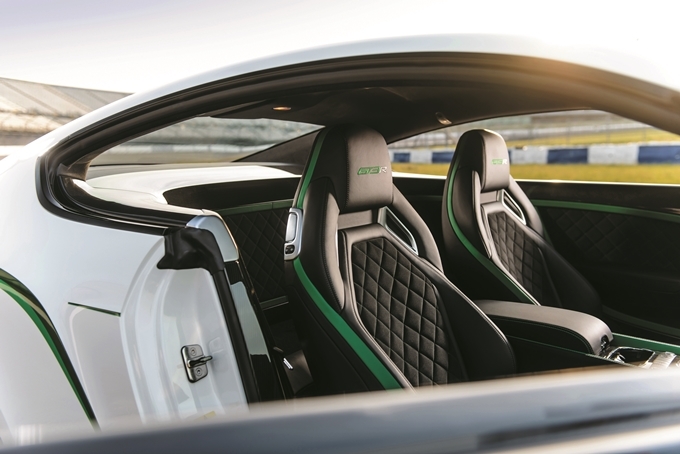 Contrasting the Beluga leather and motorsport-inspired materials is a vivid accent green, used as a hide colour on the seats, instrument panel and door panels and in contrast stitching throughout the seats and diamond-quilted areas. For the exterior a new front splitter provides an assertive look to the front of the car, balanced by a new fixed rear wing fitted to the boot lid – both finished in exquisite carbon fibre. The bonnet incorporates two vents to improve the cooling capacity of the powertrain system for repeated accelerations while also invoking the shape of the Continental GT3 racer in a styling element where form follows function. There are currently no comments on DELIGHTFULLY BENTLEY. Perhaps you would like to add one of your own?